The iPhone 3G/3GS can finally send MMS messages which are usually defined as picture or video messages. Apple Inc however further adds contact information, map locations, and other small items to the MMS definition. Although one definition that is not widely known about is Group SMS or Group Text Messages. When you turn on your Messages app in the iPhone, whether it be the iPhone 2G/3G/3GS, and you begin typing a message, you can send that message to multiple recipients by simply adding more names to the “To:” field. If you only send the message to one person, the iPhone considers it a single text message and that is how it is represented on your Rogers/Fido bill. Easy. 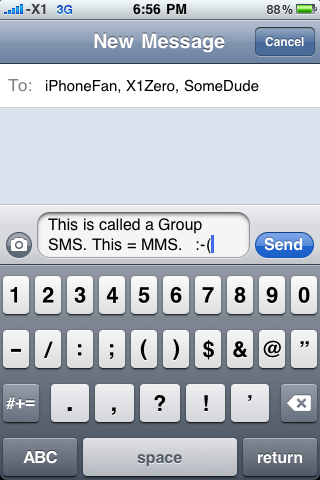 However, if you input two or more names to send the message to two or more recipients, the iPhone calls this a ‘Group SMS’ and for whatever reason, considers the message a MMS message. As such, the Group SMS message is represented on your Rogers/Fido bill as a MMS message. If you do not have a text message plan with Rogers/Fido, your outgoing text messages are charged at $0.15/text message. Your incoming text messages will also be charged at $0.15/text message as of July 7, 2009. If you do have a text message package, then all incoming and outgoing text messages are free of charge and will use the amount you have in the package. 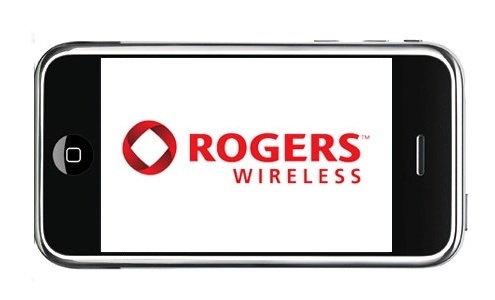 If you do not have a MMS message plan with Rogers/Fido, your outgoing MMS messages are charged at $0.50/MMS message. Your incoming MMS messages will also be charged at $0.50/MMS message as of July 7, 2009. If you do have a MMS message package, then all incoming and outgoing MMS messages are free of charge and will use the amount you have in the package. What this amounts to is if you do not have a text/MMS message package on your Rogers/Fido account, every time you send a single text message to a single recipient, you are charged at $0.15/text message. However, when you send a single text message to two or more people, it becomes a Group SMS message and you will be billed at $0.50/message because the iPhone and Rogers/Fido consider the Group SMS message as a MMS message. The only thing you really can do is make sure that you have both a text and MMS message package on your account. You can check out some of the bundled ones here for Rogers. But you know, you can always leave it up to Rogers/Fido to not make its customers aware of something like this. So if you have been sending a lot of Group SMS messages lately, this may explain why your bill has extra charges on it and you may be due for a call to Rogers/Fido to get some money back. iPhone 3GS Jailbreak/Unlock Confirmed By Dev Team!